Hubble’s main mirror being polished before installation. The edges of the were polished very slightly too flat, leaving the telescope unable to focus perfectly. 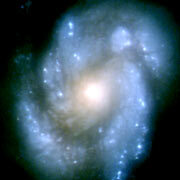 We have come to take the excellent performance of the Hubble Space Telescope for granted. However, immediately after launch people were reminded that Hubble was not just an ordinary satellite, but a complex piece of innovative engineering and, as such, liable to experience teething problems. The most serious and notorious of these was an optical defect called spherical aberration, which was caused by the malfunction of a measuring device used during the polishing of the mirror. As a result, Hubble could not achieve the best possible image quality, although still outperforming ground-based telescopes in many ways. Analysing the problem and developing an optical correction was a masterpiece of optical engineering and an outstanding example of the valuable collaboration between engineers and scientists from both America and Europe. During the first Hubble Servicing Mission in December 1993, a crew of astronauts carried out the repairs necessary to restore the telescope to its intended level of performance. The Wide Field and Planetary Camera 1 (WFPC1) was replaced with a second-generation camera, Wide Field and Planetary Camera 2 (WFPC2), which was designed to precisely counteract the error in the main mirror’s shape. This led to a dramatic increase in image quality. 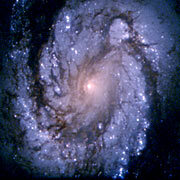 Galaxy M100 taken with WFPC1 (left) and WFPC2 (right) shows the greatly improved image quality after the telescope’s spherical aberration was corrected. The astronauts also removed the High-Speed Photometer instrument and replaced it with COSTAR (Corrective Optics Space Telescope Axial Replacement). COSTAR was not a science instrument but a collection of movable curved mirrors which could correct the path of light as it passed into the other three remaining scientific instruments: the Faint Object Camera (FOC), the Faint Object Spectrograph (FOS), and the Goddard High Resolution Spectrograph (GHRS). COSTAR in effect acted like a giant pair of spectacles, refocusing the light and letting the instruments see clearly again. In subsequent missions, the Faint Object Camera, Faint Object Spectrograph and Goddard High Resolution Spectrograph were all replaced by new instruments with built in optical correction, like Wide Field and Planetary Camera 2. This meant that, by the time of the final servicing mission in 2009, COSTAR was no longer needed. Removing COSTAR made room for a new scientific instrument to be installed, the Cosmic Origins Spectrograph.